H&R Block has ditched its TaxCut brand and now labels its consumer offerings H&R Block at Home, a logical next step in the company's strategy of leveraging its considerable brick-and-mortar tax-prep presence to promote its online services. And if you'd like to have in-person access to a live human tax expert, you may particularly appreciate the company's Best of Both service, which includes access to a tax professional. H&R Block at Home has two paid versions: the $30 Deluxe, designed for people who itemize their deductions and have investments, and the $50 Premium, which adds help for small-business or rental-property owners. H&R Block's $100 Best of Both service lets you consult a tax pro as often as necessary while you're filling out the online form; when you're done, the completed return goes to the expert for review, approval, and e-filing. Whichever version you choose (including the free service, which lacks the forms for investments or self-employment income), you will have to tack on $30 if you want to e-file a state return as well. H&R Block has given its service's user interface a complete makeover: The questionnaire now sits atop a cheerful turquoise blue background, with green accents. Individual pages are handsome, and context-sensitive help pops up in the right pane. 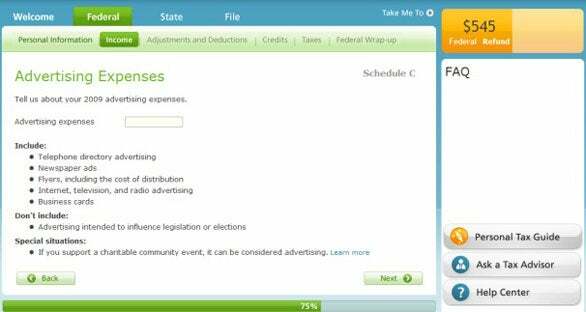 Help is just a couple of clicks away via the Ask a Tax Advisor and Help Center buttons at the lower right. H&R Block's support for data import isn't as good as TurboTax's, but it continues to grow—this year, I could import my W2 data from ADP, for example. But the service still suffers from some usability issues. You can't, for instance, jump ahead in the interview. (H&R Block's FAQ says that doing things in order minimizes errors, but some users might like the option.) I was also unable to figure out how to view forms while I was working on the return. People who are willing to take care of data entry but who like the ability to consult with a tax pro as needed might find H&R Block's Best of Both a good compromise between going to an H&R Block office and doing their taxes entirely by themselves online. Otherwise, however, I find the competition easier to use. H&R Block At Home (formerly known as TaxCut) has undergone a face lift.